Input atleast any one of - Federal Tax Id,Resale No,D&B#. New Pacific Direct (NPD) strives to make your ordering experience as simple and efficient as possible. NPD is not open to the general public. To purchase from NPD, you must have a verifiable home furnishing industry business and agree to NPD terms and policies. 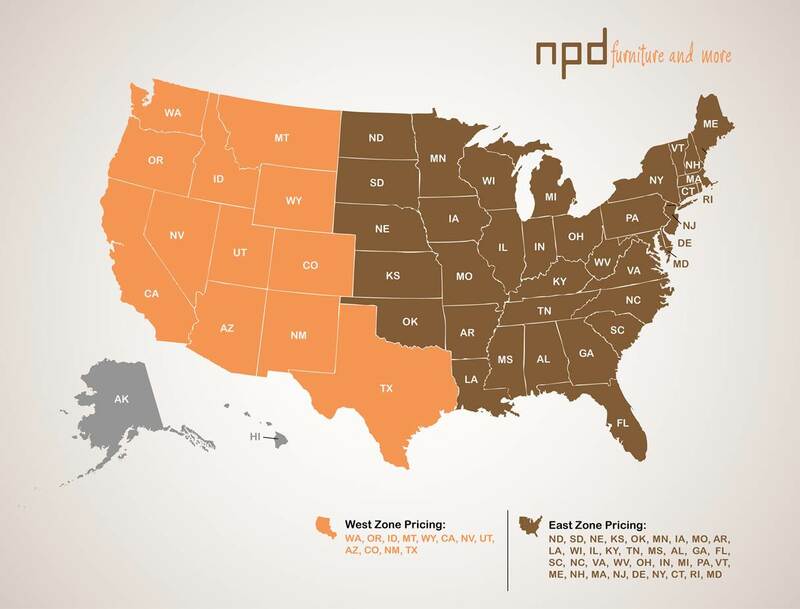 NPD has 3 pricing tiers: West Dealer (WD), East Dealer (ED), and Wholesale (WS). The Dealer Pricing tiers require a store front and determined by your location. The Wholesale Pricing tier is for designers and e-commerce businesses. NPD does not have a minimum order but customers are encouraged to take advantage of the flat freight rate program. West Dealer: AK, AZ, CA, CO, HI, ID, MT, NM, NV, OR, TX, UT, WA, WY. East Dealer: AL, AR, CT, DC, DE, FL, GA, IA, IL, IN, KS, KY, LA, MA, MD, ME, MI, MN, MO, MS, NC, ND, NE, NH, NJ, NY, OH, OK, PA, RI, SC, SD, TN, VA, VT, WI, WV. NPD offers 15% flat freight rate nationwide (48 contiguous states) and 10% flat freight rate within California. A $600 minimum order is required to qualify for the flat freight rate. All shipments are curb-side delivery to commercial addresses only, FOB (Free On Board) our warehouse. Will-call pick-ups require 24-hour advance notice. We offer 60 days credit term with approved credit. Other accepted forms of payment include cash, Visa, MasterCard, wire transfer, cashier's check, and company check (clearance before shipment). Non-sufficient check fee is $30. We do not offer COD. We are here to assist you anyway we can. Please note that we do not handle calls from consumers directly and all consumer inquiries will be re-directed to the retailers. NPD warrants that its merchandise is free from manufacturing defects and will either give credit, replace defective parts, or replace defective merchandise for a period of one year from invoice date. To file a claim, e-mail images of the problem with a brief explanation, including invoice number or PO number to: claims@newpacificdirect.com. Warranty is void for any of the following conditions: improper/abusive use of merchandise, any industrial/commercial/institutional/rental use of the merchandise, modified product, floor samples and products sold in "AS IS" condition at time of purchase. The following are not manufacturing defects and are NOT covered by the warranty: slight color variation of leather/fabric/wood, merchandise graphic color variation (i.e. photography/website), slight variation in dimensions, minor imperfection of hand-crafted products, hairline splits, and normal wear & tear. The warranty is available solely to the retailer and is not transferable under any circumstances. In no event shall NPD be liable for indirect, consequential or incidental damages of any kind. You play an important role by inspecting merchandise upon shipment arrival and noting any issues on the driver's copy of delivery receipt. We are here to help you with any damage or shortage problem during transit. Ultimately, liability for damages or losses during transit rests with the carrier. All sales are final. NPD accepts returns or exchanges for defective merchandise within 60 days from invoice date. A RMA (Return Merchandise Authorization) is required. All merchandise authorized for return must be returned in its original packaging and in new, sellable condition. NPD does not provide cash refunds and a Merchandise credit will be issued for all returns. By signing below,I acknowledge that I have read and understand the above policies. I hereby certify: that I hold a valid seller's permit No. issued pursuant to the Sales and Use Tax Law, that I am engaged in the business of selling FURNITURE, that the tangible personal property described herein which I shall purchase from New Pacific Direct will be resold by me in the form of tangible personal property; provided, however, that in the event any of such property is used for any purpose other than retention, demonstration, or display while holding it for sale in regular course of business , it is understood that I am required by the Sales and Use Tax Law to report and pay tax, measured by the purchase price of such property or other authorized amount. Description of the property to be purchase: FURNITURE.